Hello from the Fiber Studio. What a busy time it has been and it seems so long since I have added to the blog. 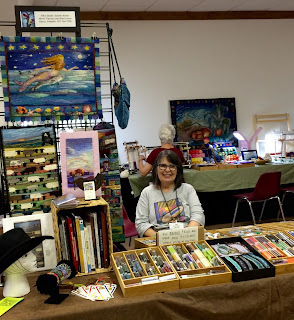 At the end of July we did the Fiber Christmas in July show and it was a very nice time to show off some of the things I've been up to lately. Before that it was the Fiberworks 2015 show in downtown Tulsa which turned out to be very exciting for me with a Best of Show for my 2014 Red Dirt Days tapestry diary and an Excellence in Handweaving award for the Hands On tapestry. 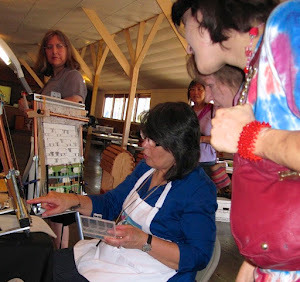 Prior to that was a week off to enjoy a Plein Air painting class in Eureka Springs, Arkansas where I discovered among other things that I might not be in good enough shape to enjoy all of the many interests I have. 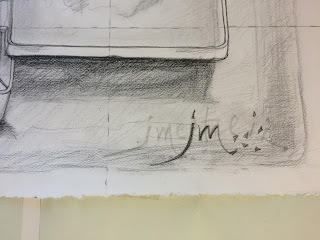 More about that later and more about that class on the Sketching Around blog soon. Just a reminder that the photos can be enlarged by clicking on them. 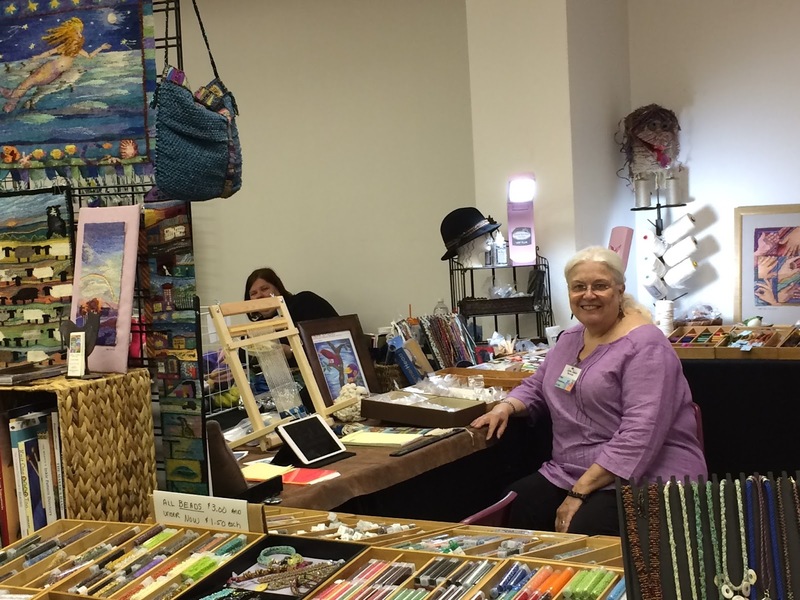 It is always challenging to figure out how to arrange everything for the best display and working ease when setting up for a show. and Janet Kozusko it would be a much harder task and a lot less fun. I was particularily pleased with the Ymmyarns display this year. As if all the packing and unpacking, loading and unloading followed by 2 to 4 days of standing, talking, demonstrating, laughing and catching up with fiber friends, swiftly followed by a repeat of the packing and loading wasn't challenging enough I decided to use the absence of loaded shelves in the studio to clean and reorganize. I had reached the panic point where the bookshelves were nearly full and there were areas of unproductive clutter (as opposed to the productive kind) that needed to be tamed. 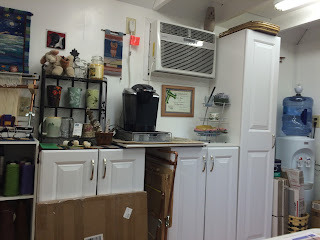 I thought I would do a virtual tour of how the studio is evolving these days. 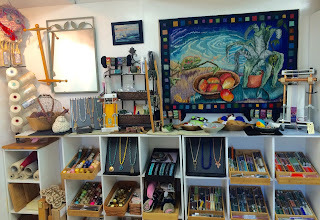 I started with the Kumihimo area. I always sell out of Kumi supplies at every show. I like to think it is because of the enticing array of finished models on display but I'm sure that the fact that learning a basic braid takes minutes on an inexpensive and very portable foam loom and offers endless possibilities to fondle fiber wherever you happen to be plays a big part in this. 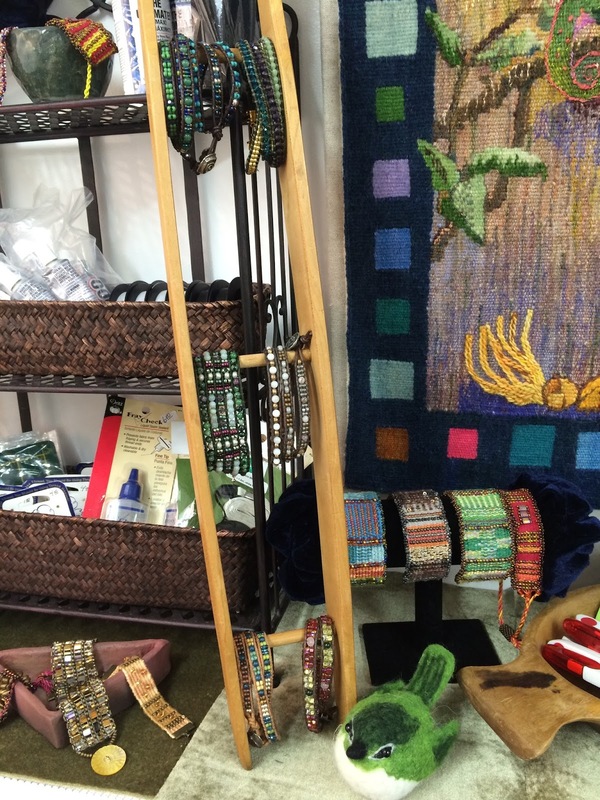 After the show I ordered new kits and worked on new display for my growing collection of all things Kumihimo. 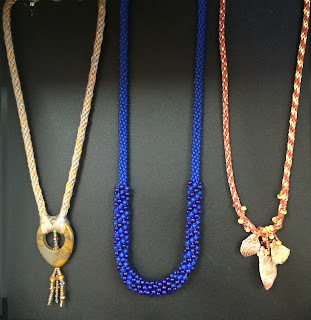 Notice the rack at the top of the picture for the new 1mm satin cord collection. I found some nice acrylic canisters which show off some projects in progress. 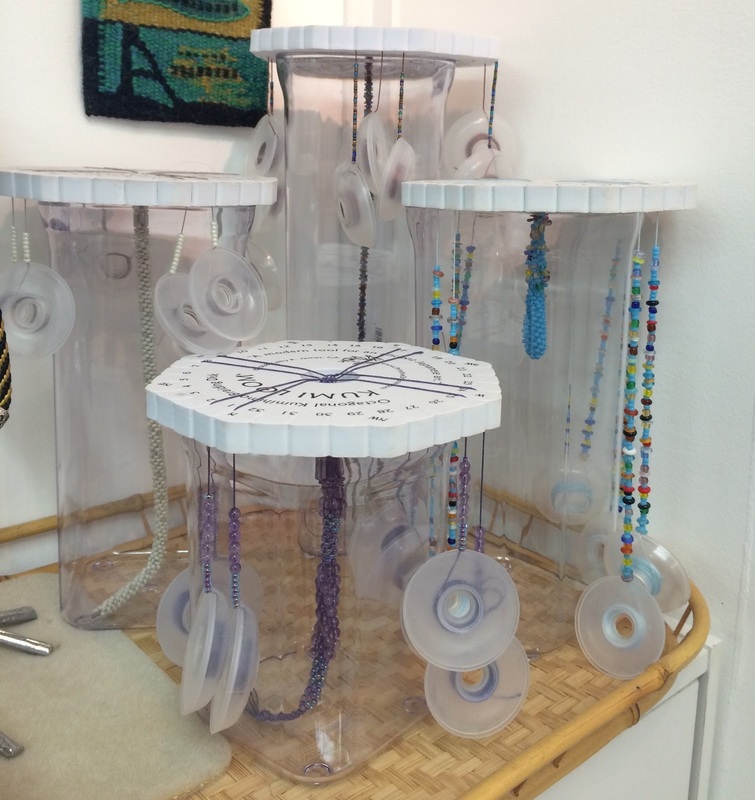 A new display for the bracelets and to show off the models I am making for every kit I carry. I like to know about what I am selling and have been impressed with these kits, only three more to go. 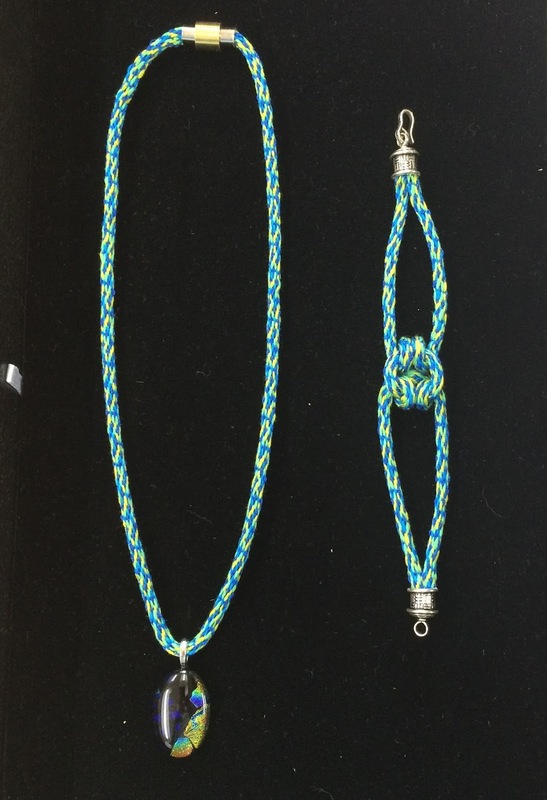 Kumihimo starts off deceptively simple but offers a great variety in the types of braids that can be made and what they can be used for. 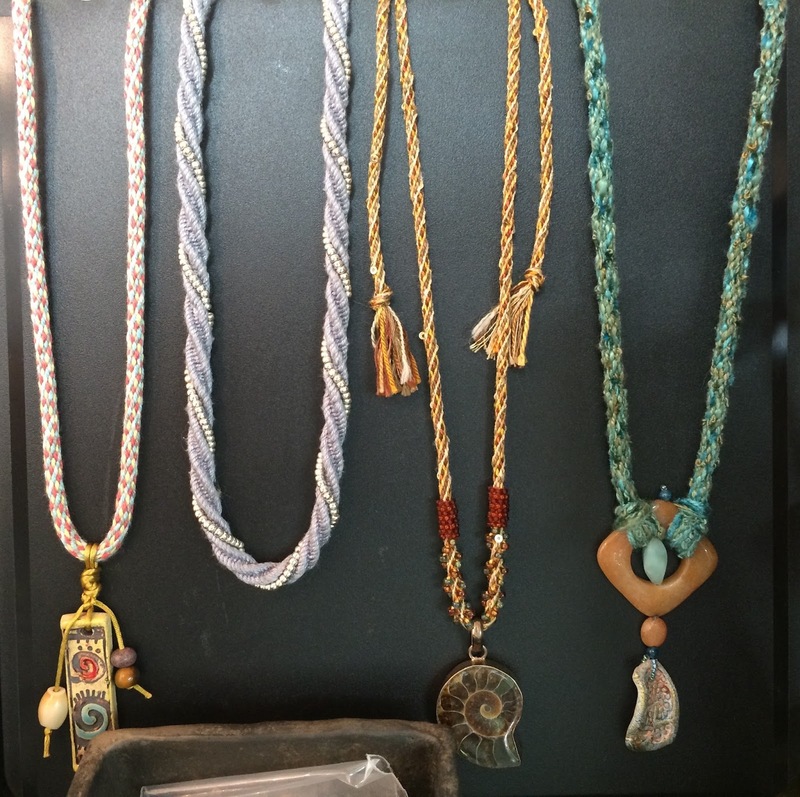 I have done many jewelry pieces with it. Here is the most recent kit I have completed. 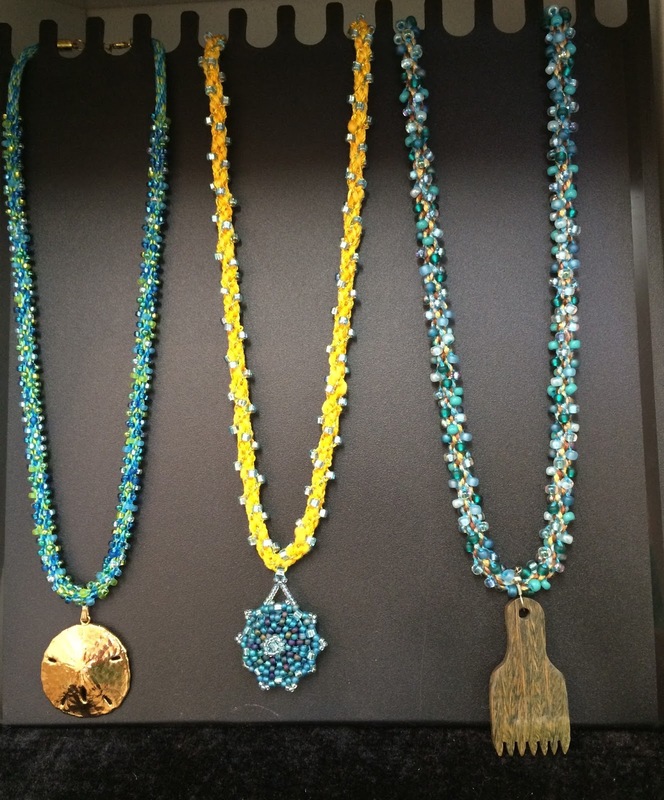 This is the dichroic pendant kit. 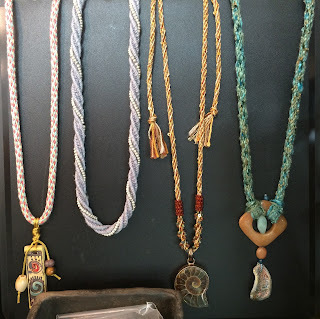 There was enough fiber in the kit to make much more cord than I needed for the pendant so I also made a bracelet, the only thing I had to add was the extra jewelry finding for the bracelet. I think this bracelet suits me and I enjoyed coming up with this decorative knot. 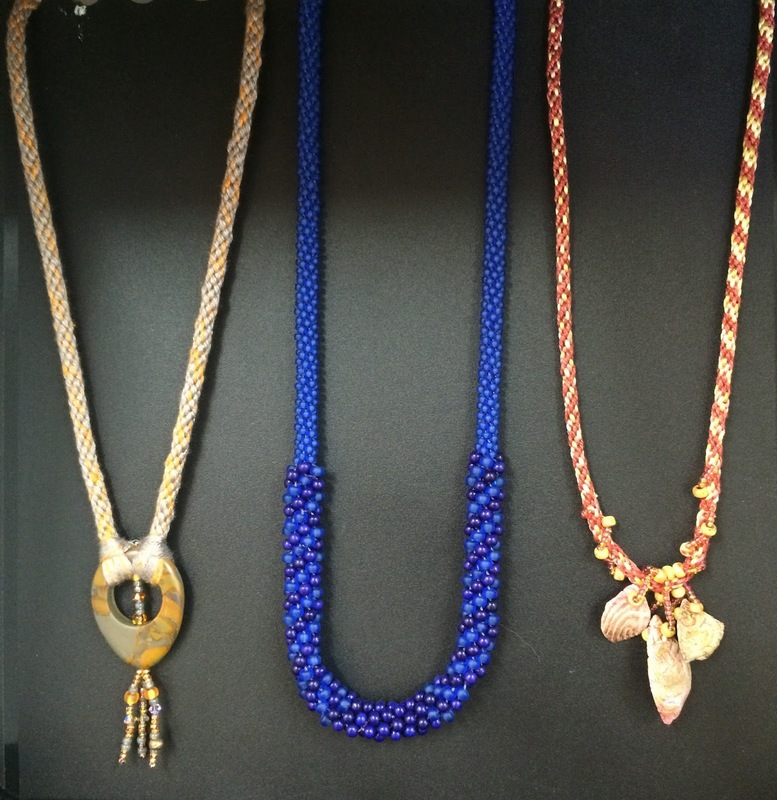 One thing I would like to spend a little time on is exploring some decorative knots. 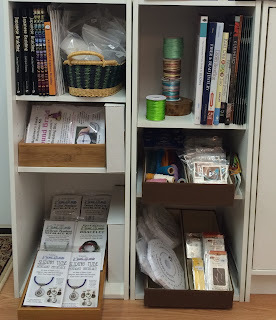 I may be adding a couple more knot books to the display soon. I was always fascinated with the Ashley Book Of Knots when I was a kid and even though knots are challenging for me I feel that they may just come in handy for a variety of things. 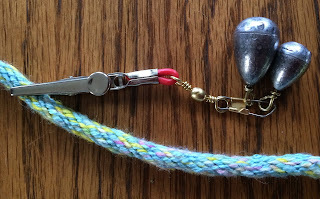 My husband Francis has even designed some clever weights for kumihimo with a strong safety pin kind of latch so that more or less weight can be added. The thicker and heavier the braid the heavier the weight needs to be. They are packaged and available now. Here is the lower part of the display. 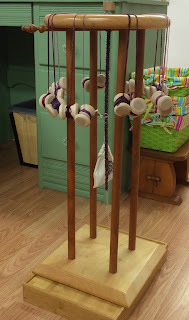 I have lots of big eye needles for stringing beads, a new sizer tool which makes it easier to determine what size braid you are making as well as looms, bobbins and kits. I have done something different with the books available in the studio. 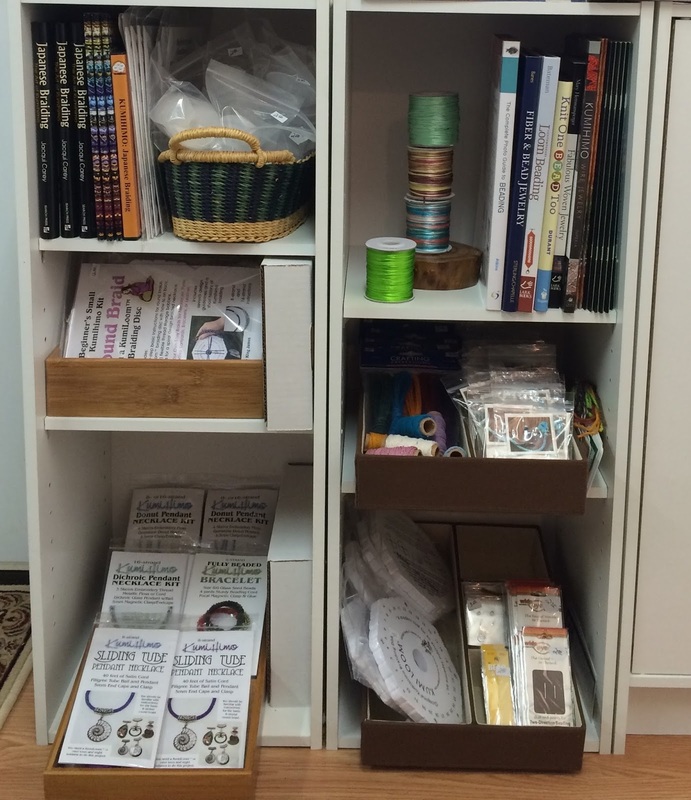 All the books on braiding, beads and jewelry are here. Book ordering has been a chore lately, it seems that everything I want is on backorder but I still have some really helpful ones to offer. 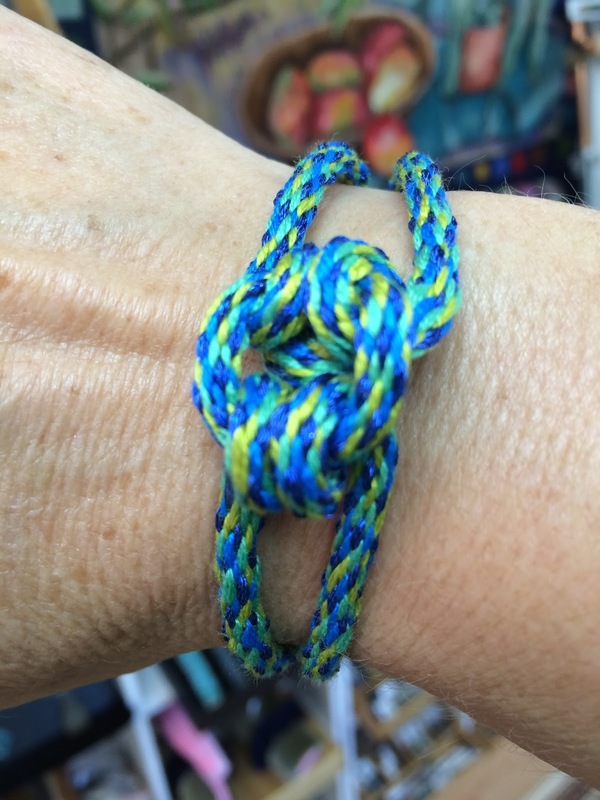 One of the things I have been distracting myself with while waiting for my new loom to arrive is learning to use my Marudai for making kumihimo braids. While the foam looms are inexpensive, portable and fun to learn on, the Marudai makes braiding a sensual experience on a beautiful tool. There is more to learn about moving and controlling the fibers on the Tama ( bobbins) but is like a dance for the hands and very meditative once a few moves have become natural. 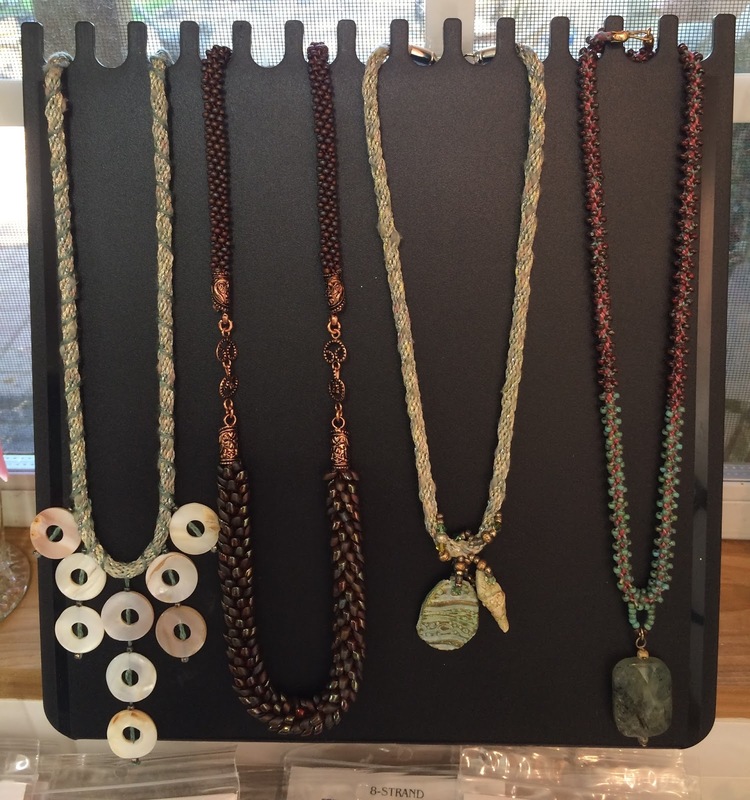 The possibilities for braids seem endless! Moving around the corner from the Kumihimo my spinning wheel sits as a place marker for where the new loom will live. Looms seem to have their little secrets and personalities just as weavers do and it takes a while to get to know each other and start working as a team. I am looking forward to this process when the new Fireside Fiberarts 48 inch cantilever loom eventually fills this space. 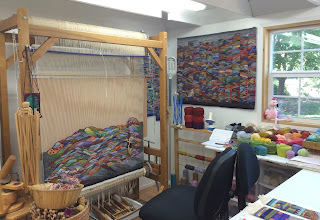 While waiting I have been working on the cartoon for my first tapestry on this loom. 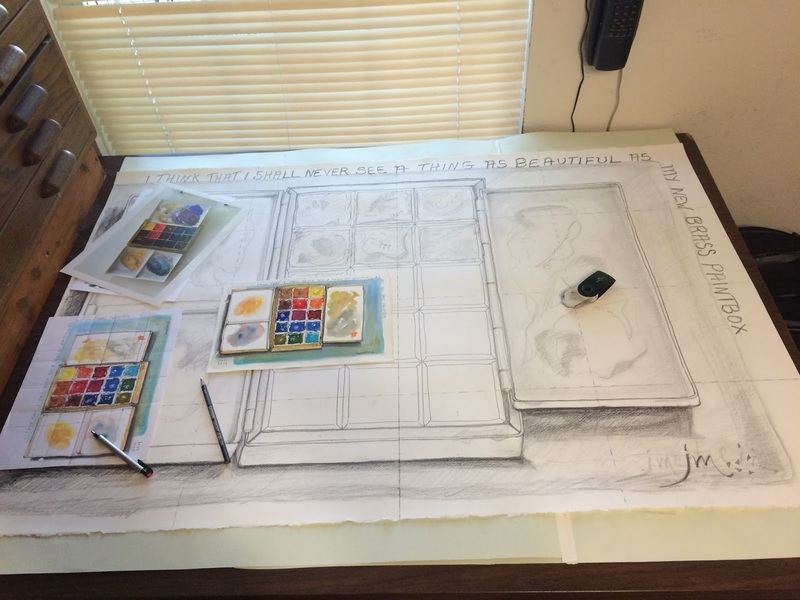 Moving over to my studio in the house where my painting, designing, and framing area resides, the cartoon continues to come along. there is not much more to do to finish it. I started in graphite and have a little more drawing to do on the actual paint wells. Once that is complete I will go over some of the main lines with a permanent black marker and then a couple of coats of fixative. I decided that the first signature drawn was too large and I wanted something simpler and more whimsical so I used these initials instead. 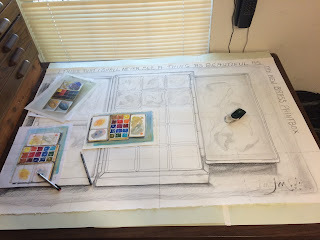 I am looking forward to trying to weave the deckle edge of the watercolor paper from the linen borders I plan for the top and bottom of the tapestry. I am also excited about the contrast between the intense pigment colors in the paint wells and the softer abstract areas of the paint in the mixing areas. 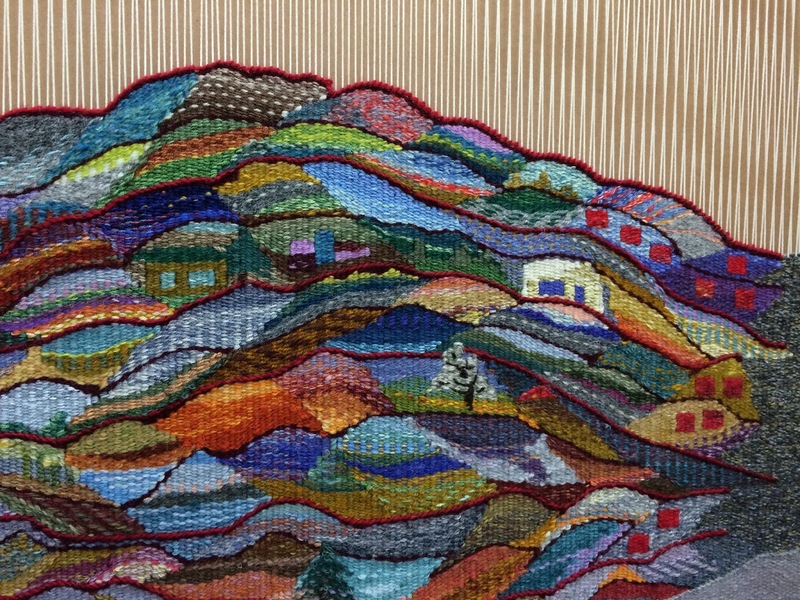 I guess a tapestry takes so much determination and desire to complete that there is a process which is a little like falling in love during the design stage. Moving along to the next wall is a mixture of items for many of the jewelry projects that can be done on the Mirrix looms. This area tends to be a little cluttered but all of these things are vital. Beads, threads, cords, findings, cuff blanks for the tapestry cuffs, ultra suede for linings; just the right needles and adhesives to make projects go smoothly. 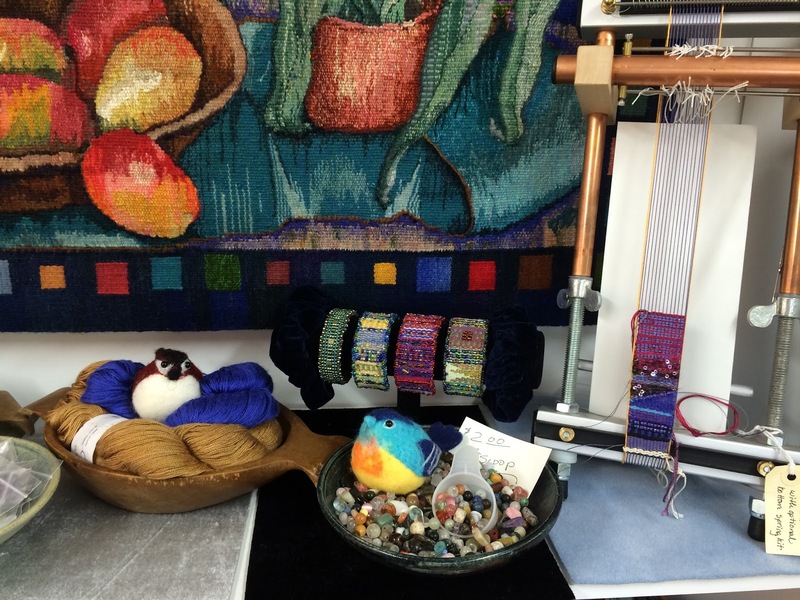 Lizzie is in the corner guarding the tapestry warp too. I have a great selection right now, 8/2 linen warp, cotton seine twine in 12/6, 12/9, 12/12 and 12/18. 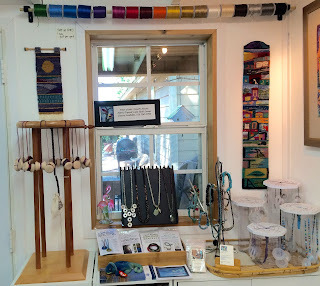 I am also on the look out for some nice wool warp to carry in the studio. 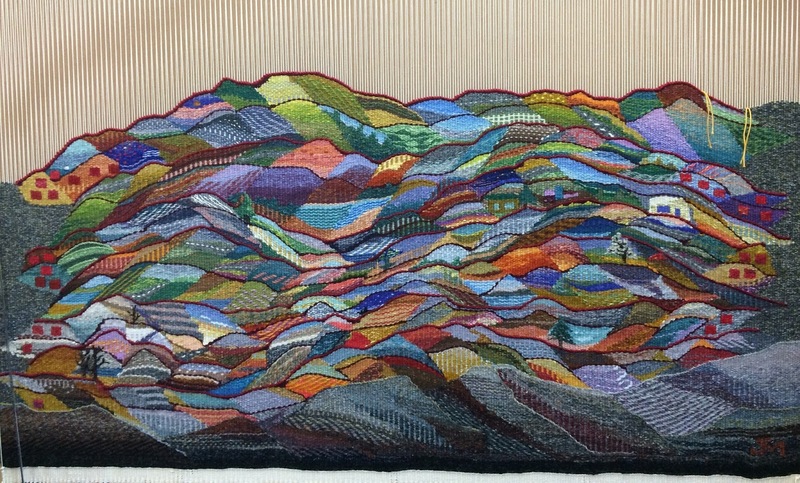 I did my first larger tapestry with wool warp and enjoy using it. 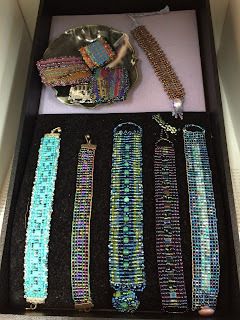 In this area are more finished jewelry pieces, like the tapestry bead cuffs, with one shown in progress on my 8 inch Mirrix. 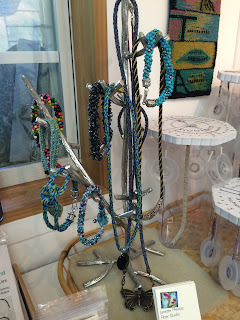 Also there are leather wrap bracelets displayed on an old rag shuttle. 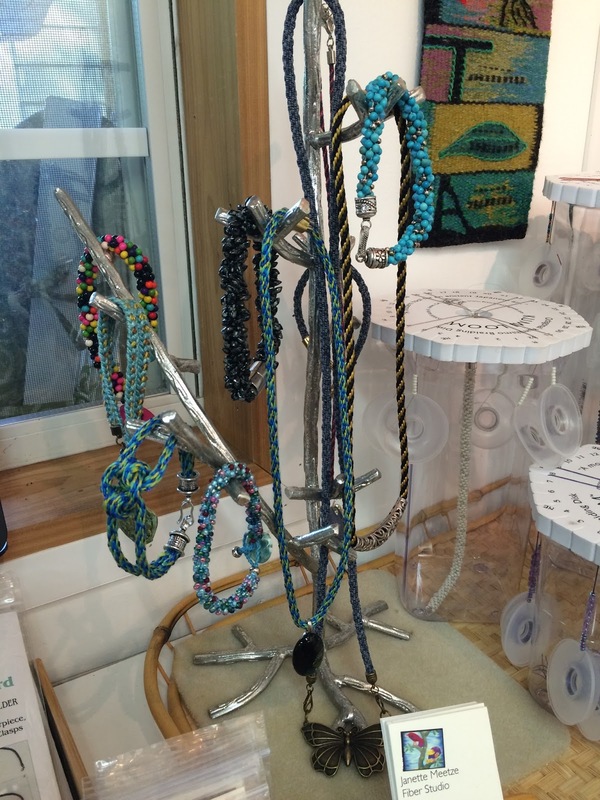 One collaborative project I am excited about is that my friend Janet is going to make up some kits for me with leather cord, semi precious gem stones and a few beads spinkled in for these leather wrap bracelets. I will be sure to show and tell about these when they are finished and in the studio for sale. 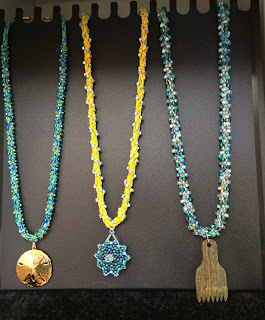 She may even teach a class or two on this fun and easy to wear project. Okay, the last of the Kumihimo! 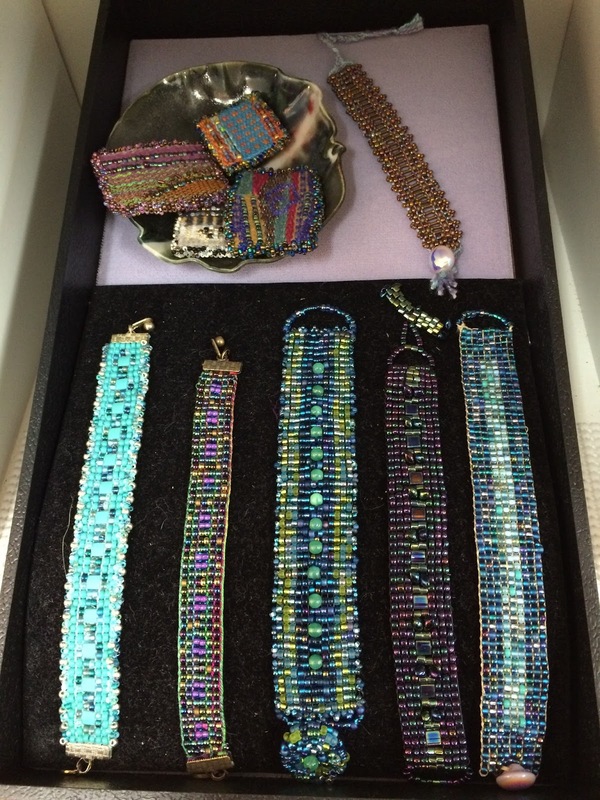 I also have many beaded bracelets done on my Mirrix Looms and some nice tapestry and bead pins. The next area in the studio tour is where the Ymmyarns live. I just ordered more of everything, wool and silk, and they should be arriving soon. 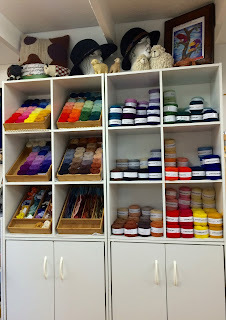 Also you may notice a couple of empty areas left for the new selection of hand dyed Oliver Twist threads from the UK. 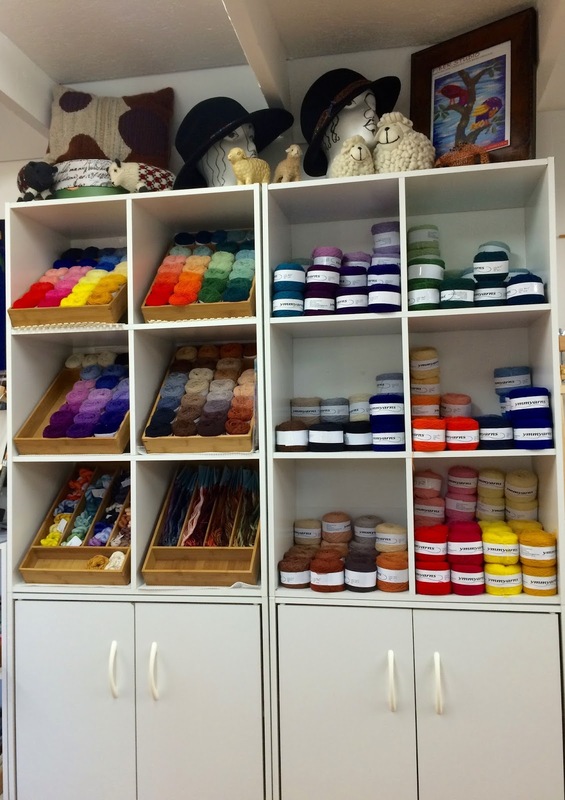 I love these threads and regularly sell out of the silk, rayon and cotton mixed thread bundles. Just two lonely ones left. I have reordered a new selection of seductive colors and added to the fun with several colors of the hand dyed ribbon as well. These are great for Kumi, tapestry cuffs, even tapestry. 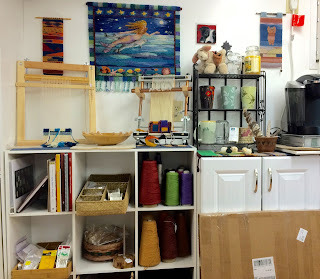 Next is my newly organized area for tapestry and weaving, including books, looms and loom accessories. This is where my John Moss bobbins live in the beautiful bowl that he made for them. Mirrix heddles, warp coils and tapestry needles. 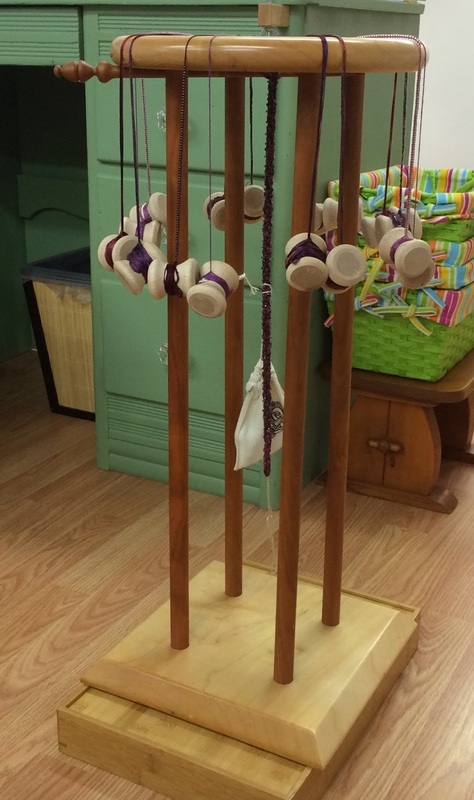 New to the studio are some Glimakra frame looms for tapestry weaving. 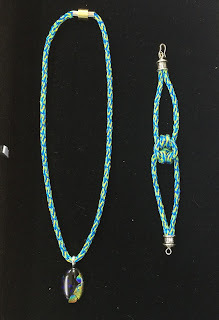 These are a step above the picture frame style loom as they have adjustable tension and have an extra brace that can be used to attach leashes. They are limited in the warp sett available in that they have pegs so you can warp at 7 or 14 threads per inch. 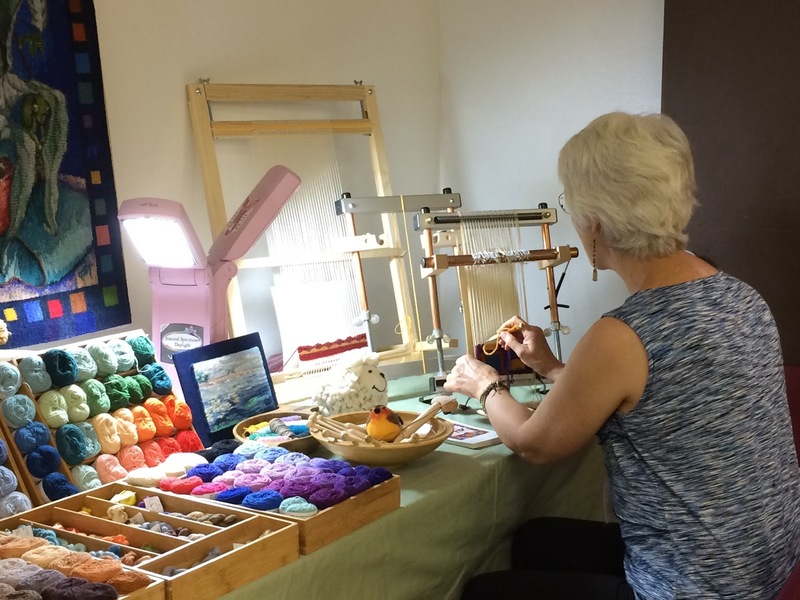 The price is reasonable though and it ocurred to me that they might be the perfect tool for sharing tapestry with a young person because they are super easy and fun to warp. 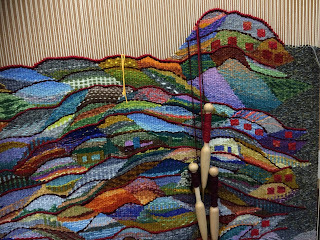 Since I had not had them before I decided to put them together, warp them and start a little tapestry so they come warped and ready to start weaving with a selection of wools and some additional written materials that I have included with what came along with them. A great way to start. if you are ready for the best then the Mirrix loom is your tool. 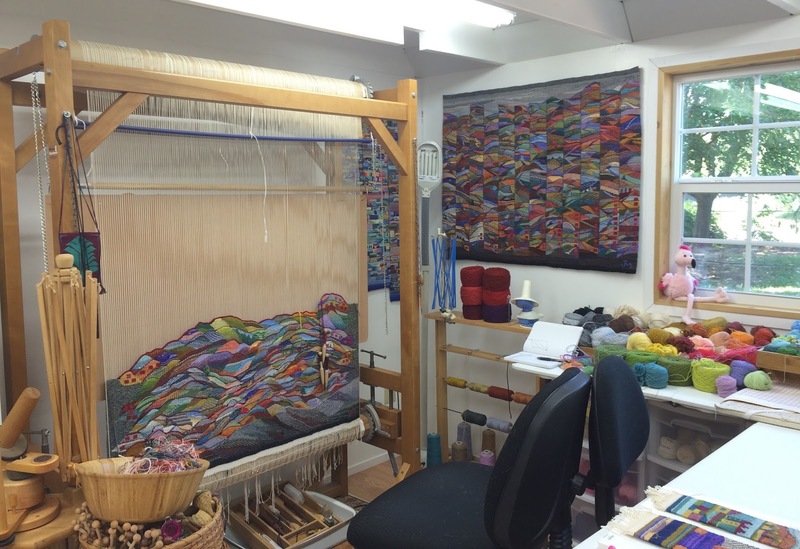 I have an extensive collection of Mirrix looms that you can see in the studio. Notice the box with a new 22inch loom that just arrived in the last couple of days. I also have both the traditional and the new electric treadle for the looms and can demonstrate as well as order them for you. 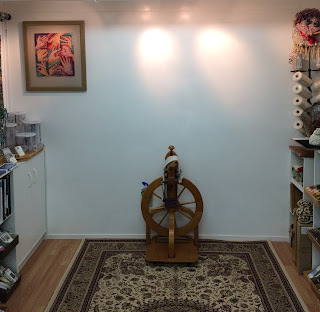 With every loom purchase I offer a free warping lesson so that you can get to know the parts of your loom and how to get it ready to weave. I also have options for private and small classes on tapestry weaving techniques as well as the jewelry projects I have on display. This is the very important spot in the studio where the coffee, tea and water comes from. I also store my shipping boxes next to the water cooler. 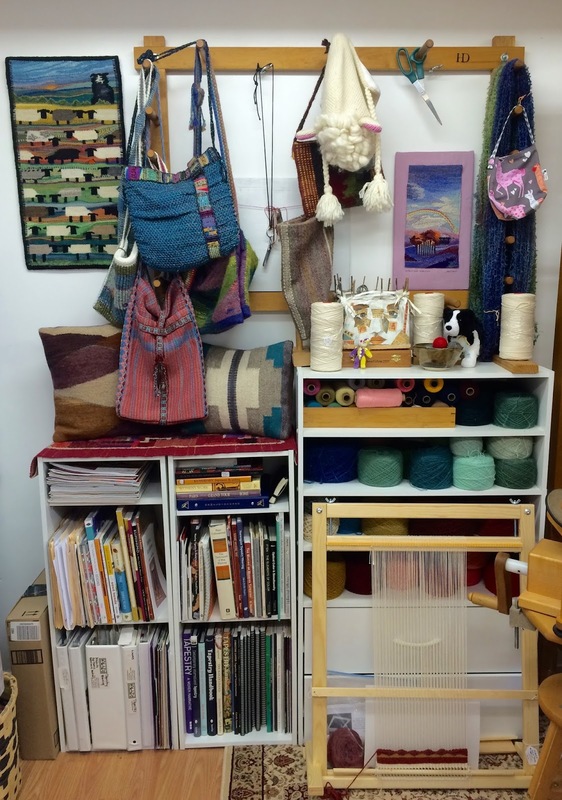 This is an area that was getting out of control with all the recycled shipping material that I use to send wool, bobbins and other lovely stuff but now is much neater with the recycled stuff stored neatly in the loft. This is my personal area. 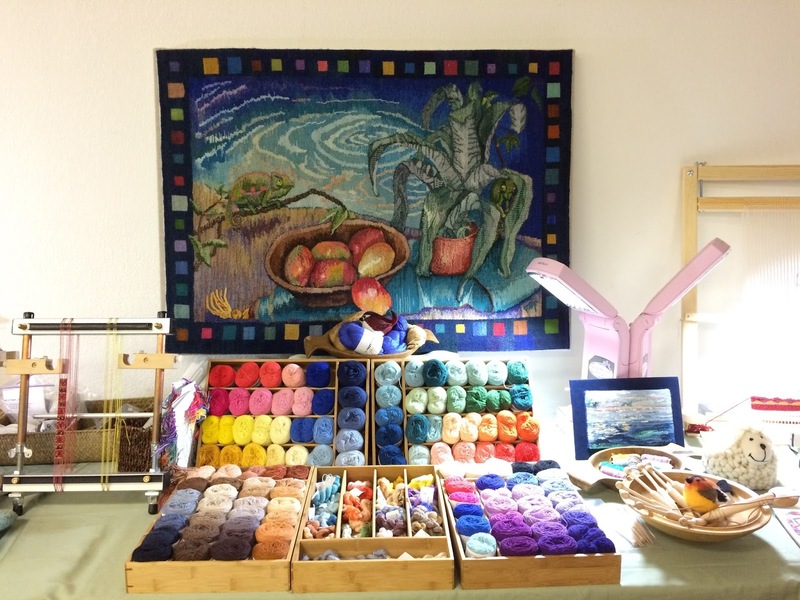 Yarns, warp in the drawers, books and class materials. That warping board is mainly for display, I have another one in the house studio that is ready for action. I have managed to find a little more space on the book shelves by taking out the pieces of foam core board and card stock that I use for various things and storing them else where. Personal book and reference space is going to a problem I will continue to have I fear. I will probably have to think about some extra fixtures in this area soon. 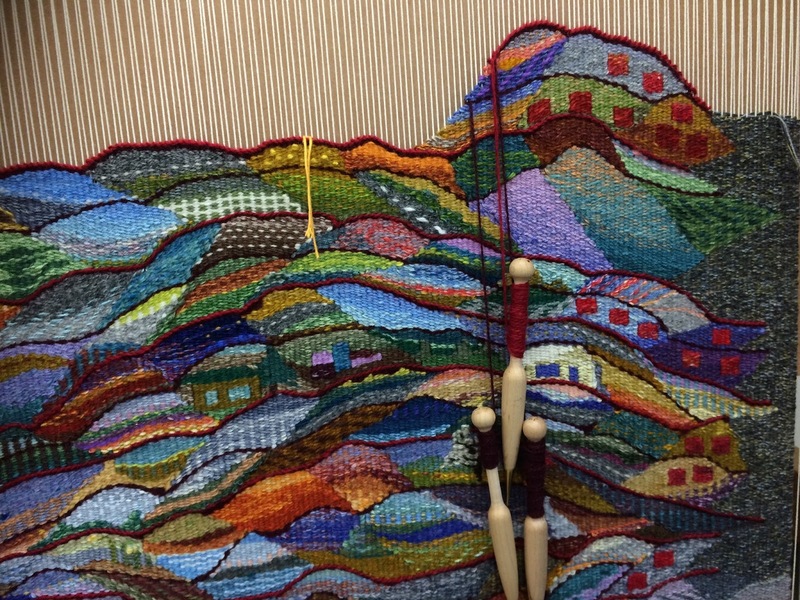 Here is my tapestry diary corner. 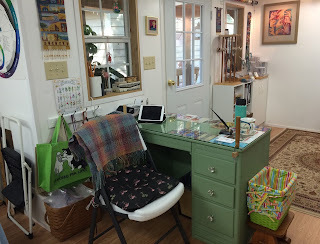 Beloved work space and window view that inspires many days at the loom. In the middle of this area is a large work table for classes and projects and another large table resides in the loft when I need extra space. 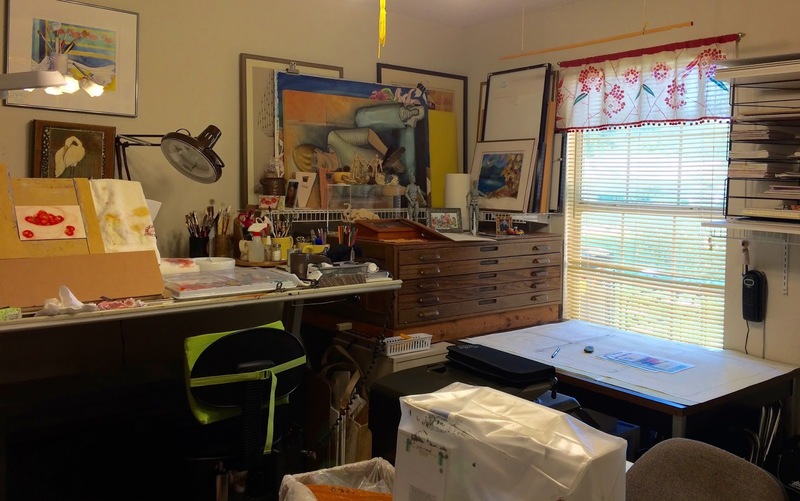 All the windows in the studio are north facing for best possible natural light. 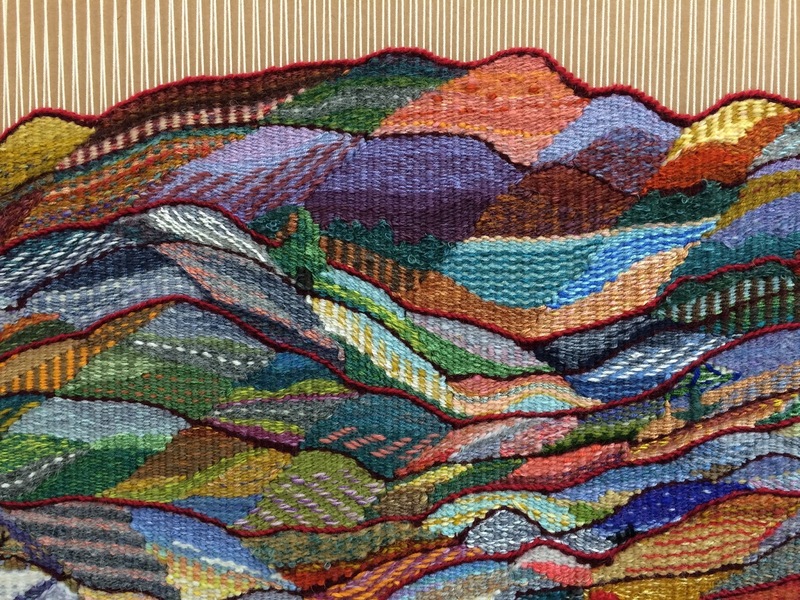 Here is a view of the 2015 tapestry diary at the end of July which I am currently calling "2015 Into The Hills". I had a feeling that 2015 might be a challenging year and so I have been working with this theme of climbing. 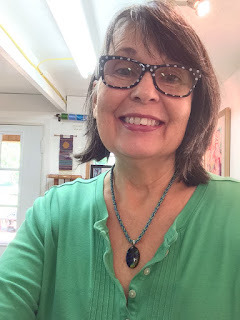 After returning from my Plein Air class completely exhausted I have decided to add another challenge to the year and added a new diet and exersise plan to my list of personal goals. So far so good on that score. One of the things I have been doing is starting my morning with a walk on the treadmill. This week I am hiking through New Zealand with a little help from Google maps and have discovered that Google maps are full of ideas for interesting shape, value and line arrangements. One thing always leads to another, life is indeed a circle. 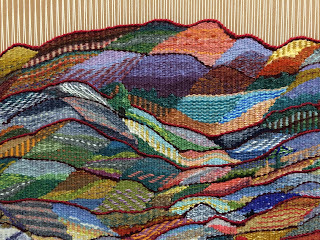 The treadmill is no substitute for a real hike but it does offer a way to get a good walk in daily and still get out to the studio and weave. Here are a couple of details of this years effort. August is beggining to take shape. Now we have moved around to the pressing and finishing area. 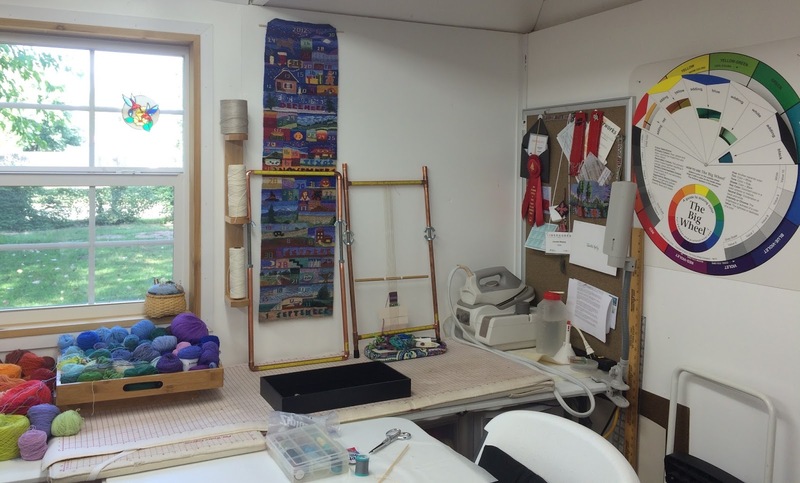 I have this set up so that I can take down my big blocking board from the loft when more space is needed for finishing a large tapestry. It functions pretty well I think. Lately I have been building some additional copper pipe looms which I hope to use for some classes soon. This brings me right around to my desk area where I am sitting to write this blog, keep all the business files, shopping baskets and bags. It is a very functional space and the desk has a glass top where I can display colorful tapestry postcards and show notices. Above the studio I have two large lofts on both sides that are handy for keeping the boxes I use for transport when I do shows and lots of things that would just be visual clutter in the space below but are important for one reason or another. Studio keeping, it is a never ending and constant challenge but for the moment I think I am in pretty good shape. 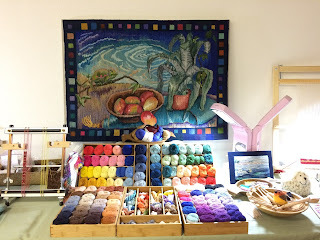 I will be sure to share the excitment when the new loom comes in and the Paintbox tapestry gets underway, news of new items arriving and the progress on the TD. 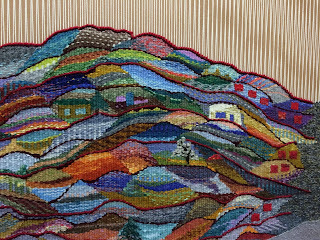 Also on the horizon is a new small tapestry on one of my Mirrix looms that will be the second in the "Hands" series. I want to get the Paintbox underway first though. Many things to look forward to. 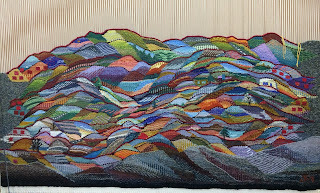 Bless your heart if you made it this far and Happy Weaving. Thank you so much for the tour. What a lovely, inspirational space! Thanks Bunny, if you are ever in Oklahoma come and see me.